Morocco has decided to proceed with the unilateral withdrawal of its armed forces from the buffer zone separating the Gueguerat border post from Mauritania on Sunday, February 6, in response to the request of the UN Secretary-General, Antonio Guterres. Morocco “takes note with interest of the statement, made public on Saturday, 25 February 2017, by the UN Secretary-General’s spokesman, concerning the serious situation in the Guerguarat area, southernmost tip of the Moroccan Sahara,” said the Moroccan Ministry of Foreign Affairs in a statement released Sunday. Morocco took note with interest of the statement made on Saturday, February 25, 2017 by the United Nations Secretary-General’s spokesman over the tense situation in the Guerguarat region in the Moroccan Sahara, said the statement. Morocco’s decision to withdraw its military forces from the buffer zone follows the telephone call King Mohammed VI had with Antonio Guterres, on Friday, 24 February, the statement said. “Morocco hopes that the UN Secretary-General’s intervention will make it possible to return to the previous situation in the region, maintain intact the region’s status, secure fluidity of normal road traffic and thus safeguard the ceasefire and strengthen regional stability, the Foreign Ministry added in its statement. The Polisario leaders, pushed to the corner by Morocco in Africa, have resorted to the only option left to them: escalating tension. They chose as a battlefield the buffer zone separating the south-westernmost tip of Morocco from northern Mauritania, although the zone is demilitarized. 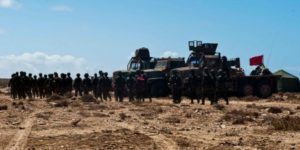 On October 2016, the Polisario deployed a group of its armed militiamen in the area in an approach seeking to irritate the Moroccan soldiers stationed at a hundred meters from there. By withdrawing its forces from this zone, Morocco will have thus avoided falling into the trap of a military escalation with the Polisario, set up by the Algerian regime and its Generals. The ball is now in the camp of the UN and the MINURSO.